Sarah did some research on garden history to find out more about the original posts in the garden. Here is what she found. The wooden pillars were the result of an early phase of organizing and integrating the garden membership through a design that reflected a new set of cooperatively agreed upon rules. We installed posts and notched pillars at the same time we removed all the makeshift fencing and replaced it with a uniform set of posts and wire to designate the boundaries of the individual plots, the central pathway and upper pathway along E. Berkeley and the vertical connecting pathway system that was covered by wood chips that were free from arborists. We also installed two gates to represent the East and Western predominant cultures in the garden and the metaphorical and literal coming together of the two! The western gate was basically a white rose arbor on the Tremont end and the Shawmut end had a “Chinese type gateway” both designed and built by artist Wenti Tsen. The pillars were to be painted red at the top to guide your eye down the spine of the garden and was the color of good luck for the Chinese. The smaller pillars were to serve as the identification of the individual plots with both the plot number and the name of the gardener which was carefully recorded on the base map when they signed up and paid their dues and signed the garden agreement stating the new rules in english and Chinese.That way everyone would know who was keeping up their plot and who was “lazy” and needed to be reprimanded. City Year did all the work with the guidance of Carpenter/builder Linda Leseyna (now at Boston Building Materials Coop) The major clean ups of that era and removal of the makeshift fencing was the product of multiple volunteer projects- from individuals in a pre release program with Mass half way houses, students from Harvard's GSD, of course the gardeners themselves and other groups from corporations, private schools , etc. 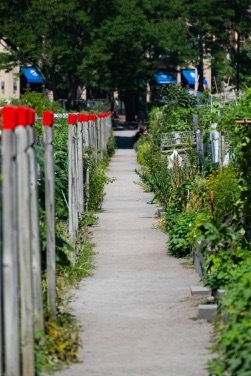 Finally, the space between the pillars and posts was designated for flowers ONLY to limit vegetable encroachment by individual gardeners back into the central pathway to increase their personal growing space. The flowers were for the community and to be a visual statement of beautification to share. Every year we would receive a truckload of flowers from Mahoney's and they would get a tax credit for every plant!